On Thursday night, Adrian Pearce found out what he got for Christmas in 1971, the culmination of a Canadian story that went viral last year and has attracted international attention. Christmas came early for Adrian Pearce, but his gift was 47 years late. It's December 1971, and Pearce is a heartbroken 17-year-old high school student in Toronto. His first serious girlfriend, Vicki Allen, dumps him, just ahead of the Christmas break. As Allen breaks the news, she hands him a gift wrapped in glossy blue paper. Pearce goes home and angrily throws it under the Christmas tree — the beginning of a 47-year vow to never open the present. The story of Pearce's unopened gift went viral last Christmas, making headlines across the world. But on Thursday night, Pearce and Allen reunited at a bar in St. Albert, Alta., to finally reveal what was behind the now-faded and tattered wrapping paper. Allen was just as curious to know what she had gifted her former boyfriend nearly 50 years ago. 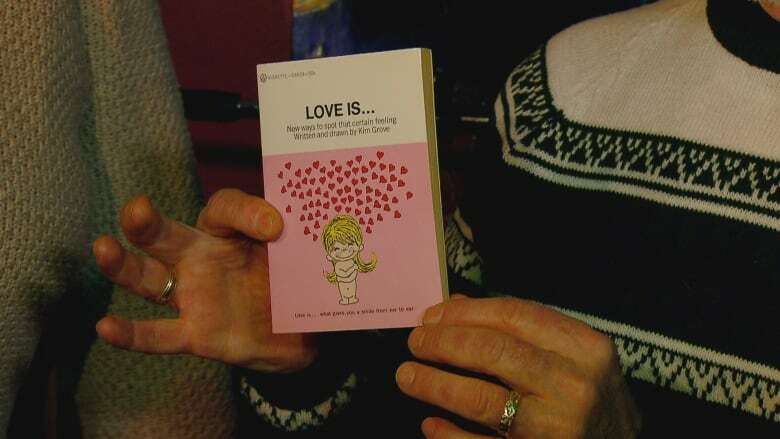 It turned out to be a collection of comic strips called "Love is…" by artist Kim Grove. The single-frame strip, inspired by love letters from Grove to her husband, each includes a caption with ephemeral descriptions of love below a scene with the same recurring couple. "I was almost in tears because it's such a wonderful thing. I'm going to frame it. It's been part of most of my life now, so I'm going to keep it there," Pearce said after the gift was opened. The pair reconnected earlier this year after a mutual friend shared the story with Allen on Christmas Eve 2017. Allen eventually agreed to make the trip to Edmonton from her home on Vancouver Island to unwrap the present. More than a hundred friends and locals packed the bar at $5 per head to watch, with proceeds going to the Edmonton Christmas Bureau. Allen took the opportunity to poke some fun at her old boyfriend. "I think that's a long time to hold a grudge. Really, it's a little worrisome. But I'm glad he did," she said with a smile. "I don't think there's anything he could have done differently that would have made me happier than what he's done with this." Pearce self-published a book about the 47-year history of the gift earlier this year, featuring chapters written by his wife, Jans Piers, and Allen. He kept the present wrapped all those years for several reasons, in part out of eccentricity, but also to keep the oath he made to his 17-year-old self. Pearce has still not broken that decades-long vow, he said, since Allen helped him unwrap the present on Thursday night. But he says it also serves as a sentimental reminder. "It always reminded me of those long-ago days that were so innocent. All of us had our future ahead of us," he said. "Every year it brought me back to being 17 years old and innocent. And, you know, I hadn't been bashed around by life as it sometimes can." Piers said she never fully understood the connection between her husband and the gift until they sat down to write the book together. Regardless, she said it was never a contentious point in their 40 years of marriage and she's since developed a close relationship with Allen. "It was just something that he never let go of," she said. "Like somebody who still has a teddy bear from their childhood." 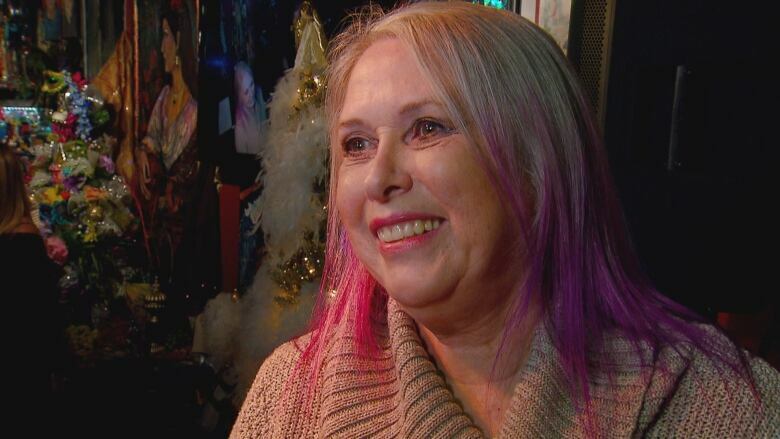 Allen, who lives with her husband outside Victoria, said she was thankful a story that started with heartbreak decades ago could find its resolve. 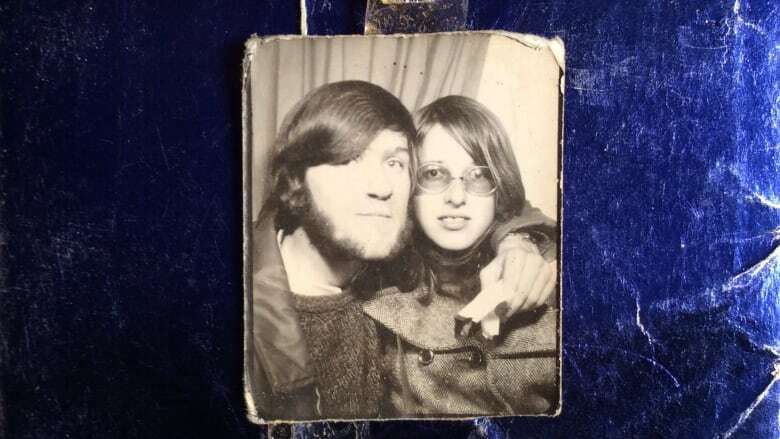 "Whatever introduction to love our high school relationship meant to us — we're very blessed, we're very fortunate and we're very lucky that we do know what love is," she said, perhaps a subtle allusion to the book she gifted 47 years ago.